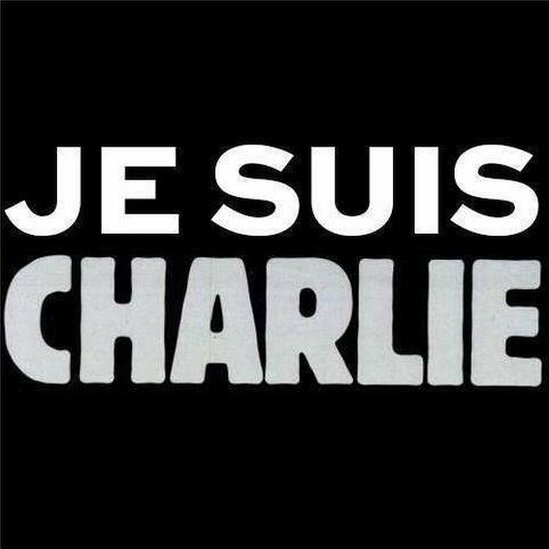 #JeSuisCharlie became one of the most popular hashtags in Twitter's short history, according to The Telegraph. In the past days, photographs were released of the murder scene at the Charlie Hebdo offices in Paris. 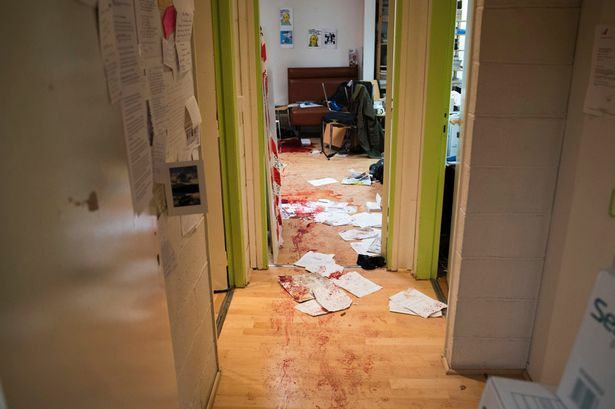 Charlie Hebdo offices murder scene. Image Source: Mirror. DUBAI, United Arab Emirates - A Saudi blogger convicted of insulting Islam was brought after Friday prayers to a public square in the port city of Jiddah and flogged 50 times before hundreds of spectators, a witness to the lashing said. The witness said Raif Badawi's feet and hands were shackled during the flogging but his face was visible. He remained silent and did not cry out, said the witness, who spoke to The Associated Press on condition of anonymity fearing government reprisal. Badawi was sentenced last May to 10 years in prison and 1,000 lashes. He had criticized Saudi Arabia's powerful clerics on a liberal blog he founded. The blog has since been shut down. He was also ordered to pay a fine of 1 million riyals or about $266,600. Rights activists say Saudi authorities are using Badawi's case as a warning to others who think to criticize the kingdom's powerful religious establishment from which the ruling family partly derives its authority. London-based Amnesty International said he would receive 50 lashes once a week for 20 weeks. Saudi Arabia's close ally, the United States, had called on authorities to cancel the punishment. Despite international pleas for his release, Badawi, a father of three, was brought from prison by bus to the public square on Friday and flogged on the back in front of a crowd that had just finished midday prayers at a nearby mosque. His face was visible and, throughout the flogging, he clenched his eyes and remained silent, said the witness. The witness, who also has close knowledge of the case, said the lashing lasted about 15 minutes. Badawi has been held since mid-2012 after he founded the Free Saudi Liberals blog. He used the blog to criticize the kingdom's influential clerics who follow a strict and ultraconservative interpretation of Islam known as Wahhabism, which originated in Saudi Arabia. He was originally sentenced in 2013 to seven years in prison and 600 lashes in relation to the charges, but after an appeal, the judge stiffened the punishment. Following his arrest, his wife and children left the kingdom for Canada. Ensaf Haidar, Badawi's spouse, was devastated after learning the flogging had gone ahead, a person close to the family told The Canadian Press. Haidar was so distraught she couldn't send her kids to school in Quebec, where she is currently living with them, the person said in an email exchange. She fled to Egypt in April 2012 with their two daughters, Najwa and Miryam, and son, Tirad, according to Amnesty International Canada spokeswoman Anne Sainte-Marie. The family moved to Quebec in November 2013. According to Amnesty, the charges against Badawi mention his failure to remove articles by other people on his website. He was also accused in court of ridiculing Saudi Arabia's morality police. In a statement after the flogging, Amnesty called the flogging a "vicious act of cruelty" and said Badawi's "only 'crime' was to exercise his right to freedom of expression by setting up a website for public discussion." State Department spokeswoman Jen Psaki has called the punishment an "inhumane" response to someone exercising his right to freedom of expression and religion. The Charlie Hebdo murders and Badawi flogging reconfirmed a radical Islamic mandate to kill or destroy blasphemers. These are not just attacks on freedom of speech. This censorship is different from violent censorship in oppressive régimes, where state critics might disappear, be tortured, and be silenced in a prison work camp or mass grave. These acts of censorship are broadly theatrical (as are others). They seek to enforce surreal new boundaries of a community using brute force and fear. These were town-style enforcement performances, projected on a global scale. Like the fatwa against Salman Rushdie, the murder of Theo van Gogh, and the Jyllands-Posten Muhammad cartoons controversy, the Charlie Hebdo terrorist attack particularly presented the world with a grim future plan for society. And, MI5 states, more attacks are to follow. 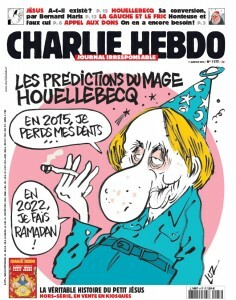 Before the murders, the last Charlie Hebdo cover featured French novelist Michel Houellebecq. Houellebecq's latest book predicts a future arch-Islamic France and was released on 7 January 2015. 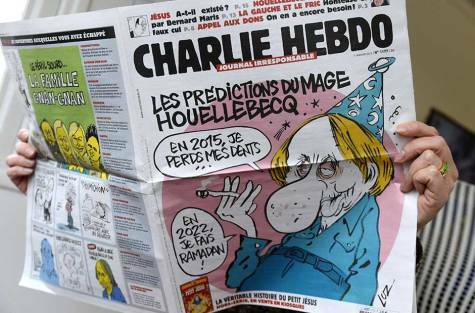 The most recent Charlie Hebdo cartoon before terrorists murdered the newspaper's main staff - poked fun at a novel about a future radically Islamic France, written by novelist Michel Houellebecq: In 2015 I lose my teeth. In 2022, I celebrate Ramadan. Image Source: Gulf News. When it comes to tyranny, you don't need to fear jihadists to fear the future. Globalization, combined with communications innovations, created vast new potentials for authoritarian power and profit. The Internet could become the skeleton of a totalitarian superstate or superstates. It is not a question of fearing only jihadists. It is a question of fearing the potential for tyranny everywhere, whether it comes from extreme traditionalists, from radical progressives, or from the middle of the road. The Web could still remain a seat of freedom. But from the point of view of future authoritarians, initial freedoms on the Internet gave anyone online enough rope with which to hang themselves. Everything you write on the Internet, reacting in the now, can be dredged up and used to judge you later. 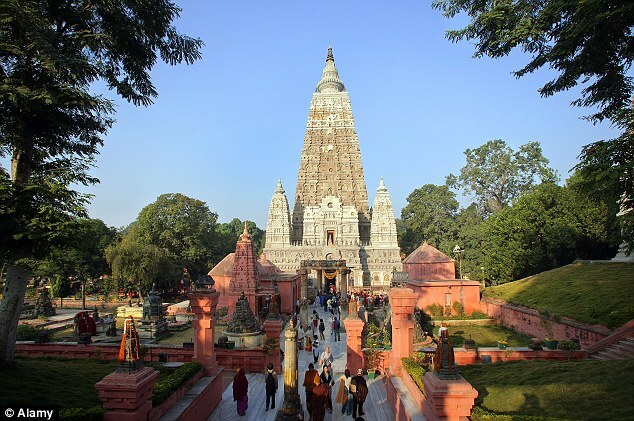 "A Japanese student was allegedly kidnapped and gang raped by five Indian men near the Buddhist shrine Bodh Gaya for a month." Image Source: Daily Mail. If you want a cataclysmic, in-a-nutshell example of what is wrong with the world today, read the news item from a few days ago about the Japanese student who was kidnapped and gang raped for a month near the site where Buddha attained enlightenment in India. Or: follow today's coverage of the Charlie Hebdo al Qaeda terrorist murders in Paris, in which twelve people died, including a policeman who was shot in the head at point blank range. The summary of those events is here. The two outrages bookended Christmas in December and Orthodox Christmas, which is celebrated on 7 January in the Julian calendar. 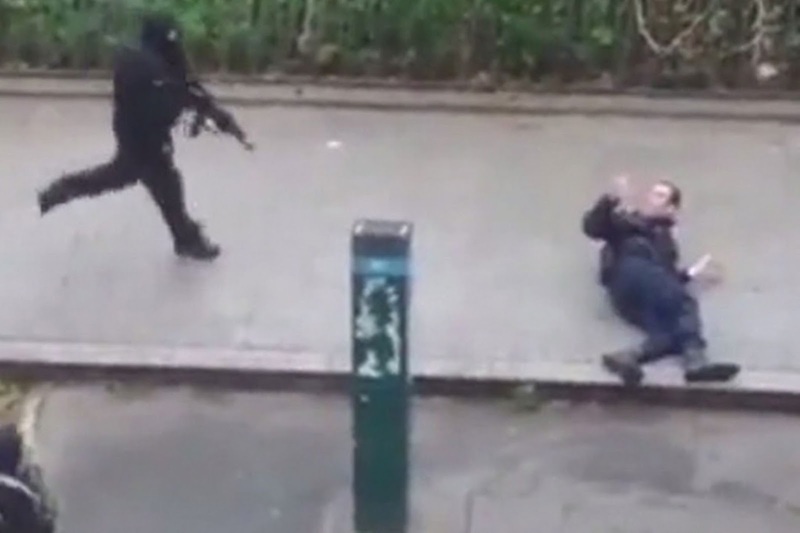 Al Qaeda terrorist murdered a policeman in Paris on 7 January 2015. Image Source: Mirror.